PC version tested. Review code provided by the publisher. There was a time not too long ago when zombies weren’t exactly mainstream. Things rapidly changed in the past few years, though, and now the undead literally dominate entertainment. “What is dead may never die, but rise again, harder and stronger”, someone once said in a quite popular TV show. With things standing like this, The Walking Dead franchise won’t be going away anytime soon: the TV show by AMC is just as popular than ever, and so are the comic books upon which the show is based. 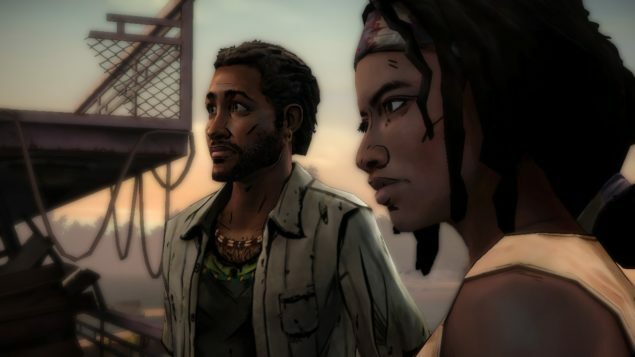 Telltale Games has also contributed to the franchise’s success with its adventure games based on it, success the team is hoping to reiterate with The Walking Dead Michonne. As the name implies, The Walking Dead Michonne stars the character Michonne, one of the survivors of the outbreak, a stoic and serious woman who has lost all that mattered to her. The tense opening sequences of In Too Deep, which feature the first of the many choices players will have to make during the course of the game, set the tone for the whole episode, a tone that feels slightly darker than previous releases. 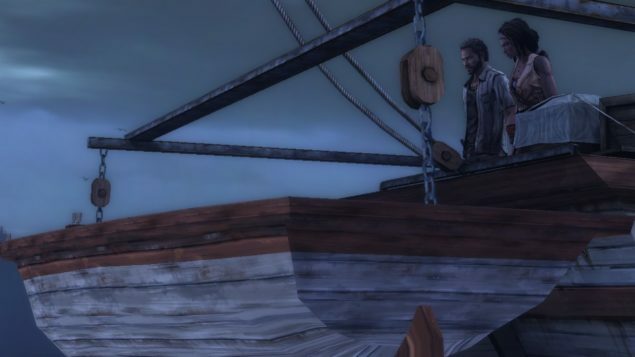 Having lost what’s truly important, and constantly paining herself over the loss, Michonne has no intention of getting closer to the crew of The Companion, a group cruising the coast for supplies and survivors that saved her from herself and her ghosts, and this is reflected in how players can interact with them. The game doesn’t really do a good job in making the player care about the crew of The Companion, but this is probably intentional, reflecting Michonne’s attitude towards others at this point of her life. Pete is the only member of the crew who appears in more than just a few sequences and his bright, positive attitude creates a nice contrast which Michonne’s. Soon enough, players will also have to interact with some despicable individuals that do manage to be a bit more memorable than the survivors’ crew, although they’re not exactly remarkable. If you are a fan of The Walking Dead, you definitely won’t be surprised by the behavior of some of these people. Despite not being all that unique, the story of the first episode of The Walking Dead Michonne is definitely engaging, making it a very strong start for this new series. Some of what may be perceived as shortcomings are most likely a precise design choice that goes hand in hand with how the main character sees the world around her. Have you ever seen a deeply pained person getting suddenly interested in knowing a bunch of strangers? No, most likely. 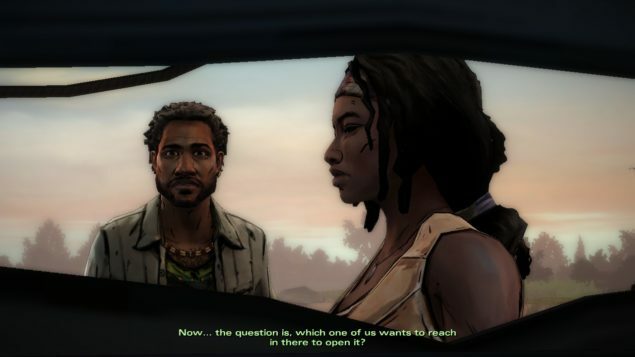 The Walking Dead Michonne plays like pretty much all of the most recent Telltale adventure games, with some of the gameplay elements receiving some tweaks, like Quick Time Events. 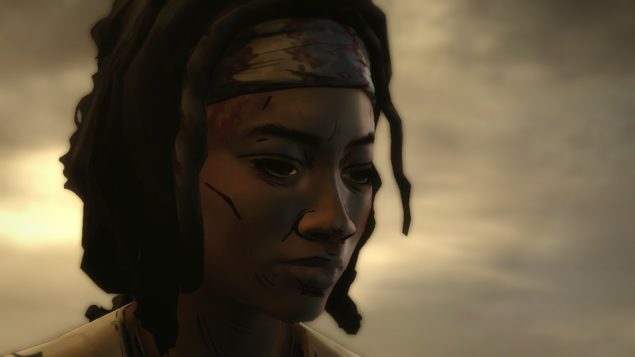 In The Walking Dead Michonne, the timing for QTE has become much more strict, most likely to reflect the increased brutality of the portrayed scenes, so you’ll most likely end up failing some of them the first time through. One particular QTE features an interesting and unexpected execution, nut the fact that you encounter it just one time in Episode One makes it feel quite weird. Failing QTE, thankfully, it’s not a huge problem, as the game brings players back at the beginning of the sequence, so very little progress is lost. The Telltale signature choices system is present in full force in The Walking Dead Michonne Episode 1, with a few interesting twists. For the first time, it feels like the silence option is the most suited for the main character, as Michonne isn’t generally very talkative. Choosing it not only feels appropriate, but it also leads to some interesting results. Also, one specific sequence will morally challenge players in a very unique way, making them choose between telling the truth or lying, only that the truth is hard to believe. A dilemma with no clear right answer that will definitely get players to think. For the rest, The Walking Dead Michonne plays exactly like previous entries of the series. Players control Michonne, move around a few locations and interact with a variety of objects and characters. Once something is no longer relevant, players can no longer interact with it, so there’s little to no challenge. This isn’t surprising in any way, as Telltale developed titles are all narrative driven, with gameplay taking a backseat. Regarding the game’s presentation, The Walking Dead Michonne features the same comic book inspired visual style of its predecessors. Unfortunately, things don’t look as nicely as they did in the past, as the game has a somewhat washed out look, with muted colors. This may have been done to better reflect the overall tone of the new series, but it still feels like something is amiss. The game also suffers from some performance hiccups every now and then. While they don’t impact the experience that much, having them happen during dialogues completely breaks immersion. Animations also look unnatural at times, such as Michonne’s sword honing motion, so their ridiculousness takes a bit away from the somber atmosphere of the first episode. While the overall look of the game is nothing to write home about, the audio production is on a different level. Music is definitely serviceable, enhancing some of the most dramatic sequences, and the voice acting is very, very good. Michonne’s voice actress, in particular, has managed to convey the character’s internal turmoil very effectively, making her even more enjoyable.